Today, I am decorating the house with our collection of Christmas candles, figurines, Santas and snowmen. 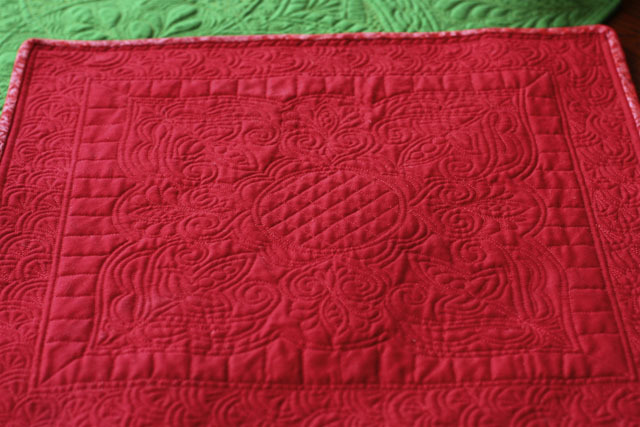 I have several red and green small quilts that I use as a base for my collections. Time to run. My house is a wreck of boxes, tissue paper and bubble wrap! I have enjoyed sewing and crafting for many years but about a year ago became interested in learning how to quilt. 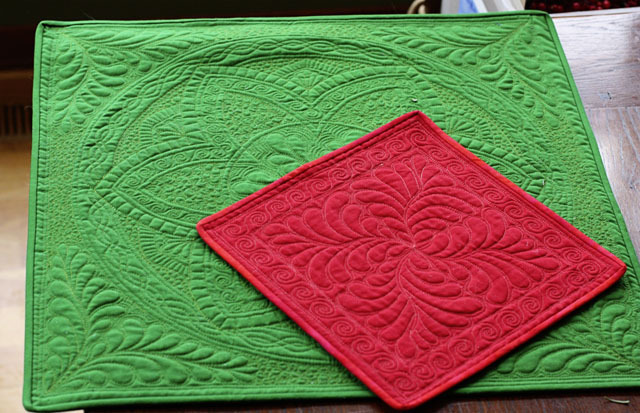 I ‘thought’ the beauty of quilting was in the top but have come to learn that the back or quilting process has a tremendous beauty of its own. You are truly an artist. Thank you, Judy! 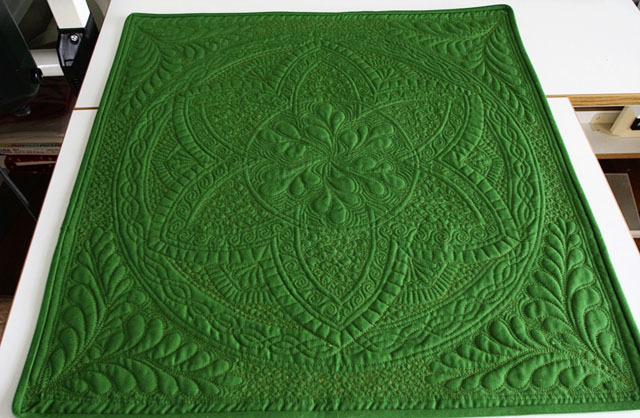 It is a good idea to plan the quilting as one plans the quilt top–that way you can leave open areas that just emphasize quilting. 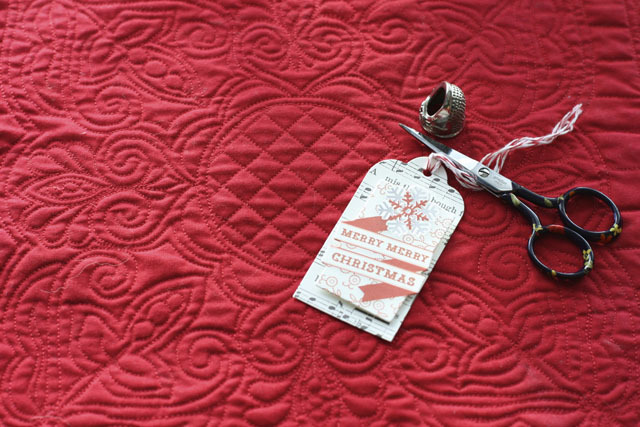 Can’t wait to see some of your quilted creations! Lori, these are just stunning! I really hope to “grow up” one day into as accomplished an FMQ’er 😀 Thanks ever so much for the continuing inspiration. I am so impressed! I want to be like you someday! However in the meantime, if you ever decide to make more than you need and sell them…let me know! Right now I am immersed in photo projects. I love your photo projects-can’t wait to see what you’re creating! Those are gorgeous and what a great idea! I’ve never tried a stencil, but I think I need too. I love that you added to it. Thanks, Janice! Your quilts are fabulous! 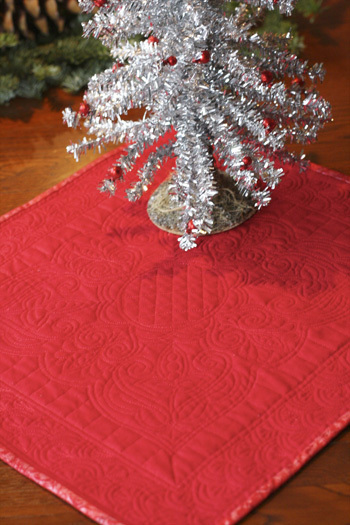 I love your Christmas tree skirt. These are just AMAZING. The details are unreal! 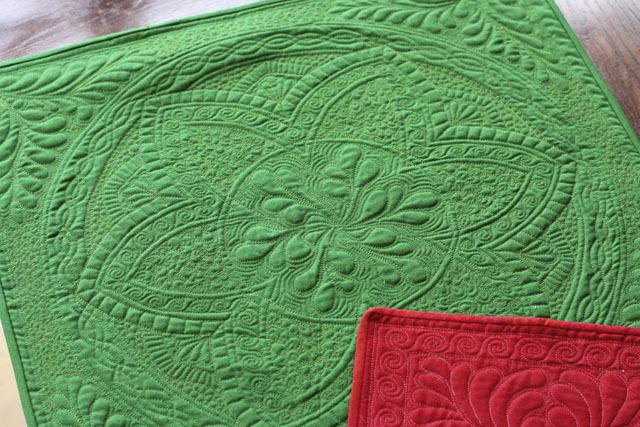 Thank you!-The green quilt – though small-took a surprising amount of time to quilt. I use it a lot-Christmas, St. Patrick’s Day, etc. Gee, I don’t quilt but that is really lovely and appreciated. What a gorgeous project! wish I could find a stencil like that! 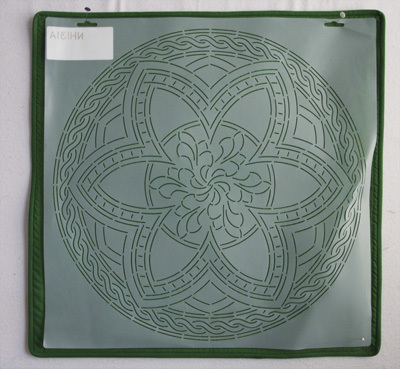 I am planning to do more tutorials and projects using stencils as well as doodle quilting–check back often! I love to start new projects and ideas in January….more to come! Wow, I can’t even imagine how you get that done in a reasonable amount of time. Amazing. It that all by hand? I’m stunned. I’ve done some seminal quilting (strips sewn together, cut and then re-sewn), but that pales in comparison. This is quilting to the max. It is all machine quilted–much more time efficient! wow, wish they still had that stencil available for sale. I really love it. Also , I have to say, while searching their website for this stencil I ended up buying about 8 others from them that I liked too. Looking forward to them arriving so I can play with them. You will have fun! Can’t wait to see what you make with the new stencils! Small projects give you the skill and confidence to try the bigger ones. I love all of my little vase quilts. And if the mess us is big…I put a bowl on it instead of a vase! Do you have a preferred method or pencil for marking the stencil to start with? There are so many choices and I am sure you have tried them all. And when working with a stencil, how do you decide where and how to start stitching the design? I like Fons and Porter white mechanical pencils and Clover’s chalk wheels–especially nice for straight line and grid stencils. I have started using the Frixion pens–just remember it takes steam to remove them. Many people I trust use them exclusively. As for where to start…as I am tracing the design, I try to look for a good place…but often it doesn’t matter. I don’t have any real advice for you…I’ve had stencils that I could not figure out at all–my quilting was a mess. Two things that DO help: when you are tracing the stencil, fill in the “gaps” in the lines that are there to hold the stencil together. And make sure you can easily see all of your lines. If you have to pause for even a moment because you can’t follow the path, there will be noticeable mistakes in your FMQ. Hope that helps!